One of the many requirements of HIPAA, passed in 1996, was that each individual provider would have their own National Provider Identifier (NPI). This number would replace all of the multitudes of different provider numbers each providers had for each insurance company with which they were contracted. Although this made it easier for insurance companies and the federal government to identify and keep track of providers, it made it very difficult to file claims. One of the reasons was because claim forms did not have a space to put your NPI! If you're interested in mastering the CMS 1500 claim form, we recommend the ebook How to Complete a CMS 1500 Form. It's a detailed guide to getting everything just right, written by a very experienced mother/daughter team of medical billers. Learn more about it here. 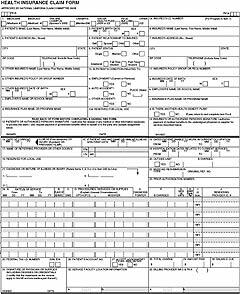 The HCFA 1500 claim form was the pre-HIPAA version of the form, on which all medical providers sent claims to insurance companies, Tricare, and Medicare. all necessary provider identifying information. Because NPI numbers did not exist, there was no place to include them on the claim. 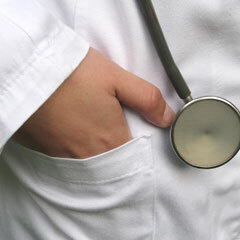 Provider identifying information is an important part of a medical claim. If your provider isn't in-network with the insurance company, then the insurance company will process the claim out-of-network. This means they may apply the allowed amount to the patient deductible, rather than paying for the claim. The same thing will happen if the patient is required to select a primary care physician (PCP). If the patient sees a doctor that isn't their PCP, then the insurance claim will process the claim differently. This usually also results in a patient balance, due to a non-covered service. The implementation of HIPAA and the NPI requirements made it necessary to re-design the HCFA 1500 claim form. This was completed and the new CMS 1500 claim form was put into use. This transition happened in many stages, as the implementation date of both Provider NPI numbers as well as the CMS 1500 claim form was pushed back many times. Depending on your state, the transition away from HCFA was finalized sometime between 2007 and 2008. After these dates were finalized, all insurance companies, the national government, and all medical providers are required to use the CMS 1500 claims forms, complete with their NPI numbers. Most of the changes on the claims forms were small differences from the HCFA 1500. In some areas the wording was changed to reflect updates to the medical industry. Almost all other changes occurred in the areas in which provider ID numbers are listed, as well as diagnosis, procedure, and modifier information fields, which were more clearly delineated. The idea behind many of these changes was to provide areas in which to put additional information. There were also specific boxes added, in which providers can provide their provider NPI numbers. Dental forms, which are different to medical forms, were also updated from the older UB92 version to the UB 04 version, to accommodate the same kind of changes due to HIPAA requirements. The changes of the HCFA to CMS-1500 claim forms simply reflect the constantly changing nature of the medical industry. Sometimes it seems hard to keep up. But this is why it's important to stay focused, keep your eyes open, and stay up to date with what's happening in the medical industry. Click for a CMS 1500 claim form tutorial. Master the CMS 1500 form with this guide.